As many of you are already aware, the citizens of Nashua will be electing a new mayor this November. Different candidates have been announcing their decisions to run and gearing up for the primary election which will be held in September. One of these candidates is Chris Williams, the former President and CEO of the Greater Nashua Chamber of Commerce. We have worked with Chris for the past nine (9) years when he held this position, and we gradually got to learn more about Chris and his vision for the City of Nashua during that time. He approached us, along with other property owners here in the Millyard district, about hosting an event for him during his campaign. 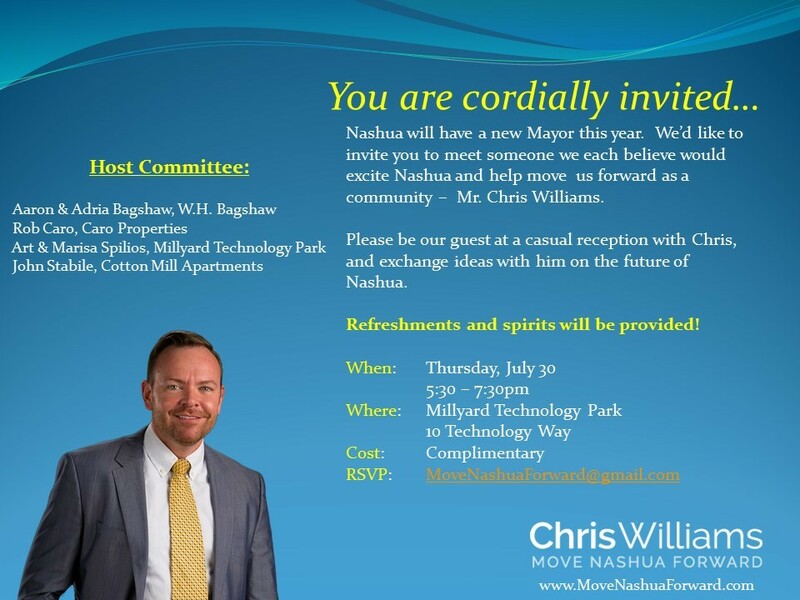 On Thursday, July 30, from 5:30 – 7:30 PM at our own Riverview Café, there will be a reception with light food and beverages where Chris will be communicating some of his ideas for Nashua. It will be a casual meet-and-greet type of event where guests can give Chris some feedback and hear about what he would do if he were to become the next mayor. We want to be clear that Millyard Technology Park and Crown Linen Service, Inc., do not endorse Chris Williams or any other political candidate in this upcoming election season or in any election cycle. So far on the campaign trail, Chris has already discussed how he thinks the Millyard district is an important and yet under-utilized part of the city. He has plans for how to make the Millyard as a whole become a focal point and a destination. For these reasons, we do think it is important for those of us who come to work at the Millyard every day to hear his thoughts on this subject. If you would like to attend, please RSVP by sending an email to MoveNashuaForward@gmail.com. Having an accurate head count will be helpful for planning the food and beverages served that evening. Please see the invitation below for more information.